The CTA Valued Added Index (CTA VAI™) illustrates the long term benefit of managed futures and provides a valuable CTA diversification index/metric. The index illustrates the risk adjusted added value of including an allocation to managed futures/CTA strategies within a core equity benchmark portfolio. The index highlights that managed futures consistently adds value over the long term and not only in times of financial crisis. Managed Futures consistently adds risk-adjusted value over the long term, not only in times of financial crisis. There is a timing aspect to adding or increasing exposure to Managed Futures. CTA VAI™ compares the Sharpe ratio of a 90/10 portfolio that has a 10% allocation to Managed Futures versus an all S&P portfolio. Barclays BTOP 50 CTA index is used for the 10% allocation. Index computes the value added difference in Sharpe ratios between the two portfolios on a rolling 60 month basis. A positive number is reflective of the additive risk-adjusted benefit of using Managed Futures within the portfolio. 60 month period captures both up and down cycles in the equity market. 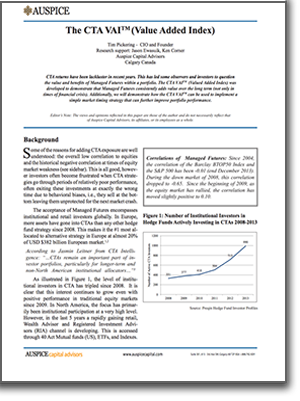 The CTA VAI™ is generally positive illustrating that whatever the current performance of the CTA benchmark, there is an additive risk-adjusted long term benefit to including Managed Futures within a portfolio. Including 10% Managed Futures to the portfolio has added value in rising and falling equity markets. When the CTA VAI™ has dislocated the most from the S&P, it has been a valuable time to add CTA exposure. The CTA VAI™ is calculated taking the Sharpe ratio of a portfolio including 90% S&P 500 and 10% Barclay BTOP 50 CTA index (re-balanced annually) minus the Sharpe ratio of the S&P 500 multiplied by 100. Example: Dec. 02: -0.05 minus -0.10 = 0.05 multiplied by 100 = 5.59.